The REV’IT! Outback 2 jacket is versatile multi-season garment. It’s styled for adventure with more of a standard 3/4 jacket length in the front. The Outback 2 includes multiple liners which can be swapped in and out or combined. These cover most weather conditions and the ventilation works well also. 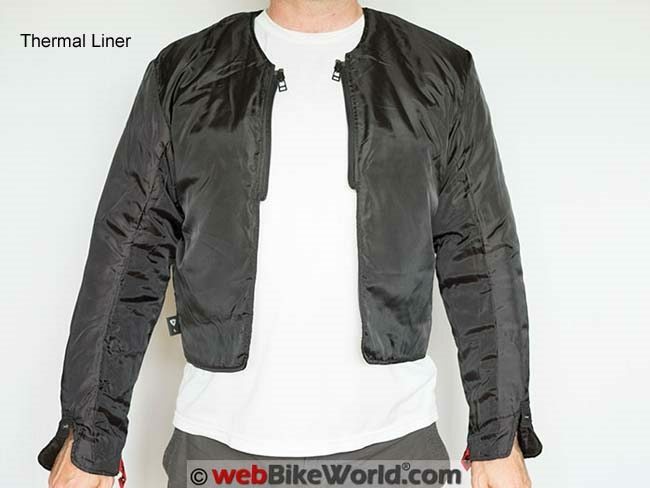 But whether it is a three or four season jacket will depend on where you ride in the hotter season. The REV’IT! 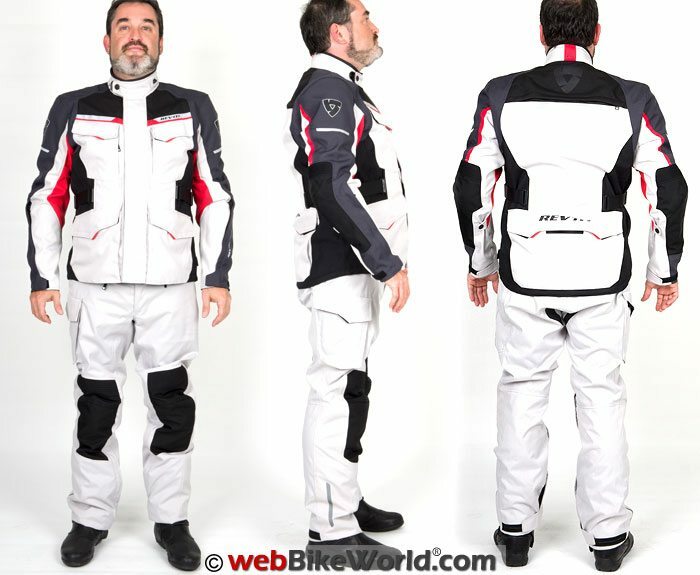 brand is well known in the motorcycling world for making versatile and innovative riding gear but I’ll admit that until recently I have not had much on-hands experience with their apparel. I also wasn’t aware of the vast variety of products they offer. REV’IT! has been around for some time and has always focused on bringing quality mid-range to premium products to the motorcycle gear market. Their collection now spans jackets and pants as well as gloves, base layers, footwear, and more. In fact, I had the opportunity recently to check out one of their one piece leather racing suits and I found the build quality to be outstanding. So Carmen and I jumped at the chance to do a “two-fer” review of the latest update to the popular Outback jacket. 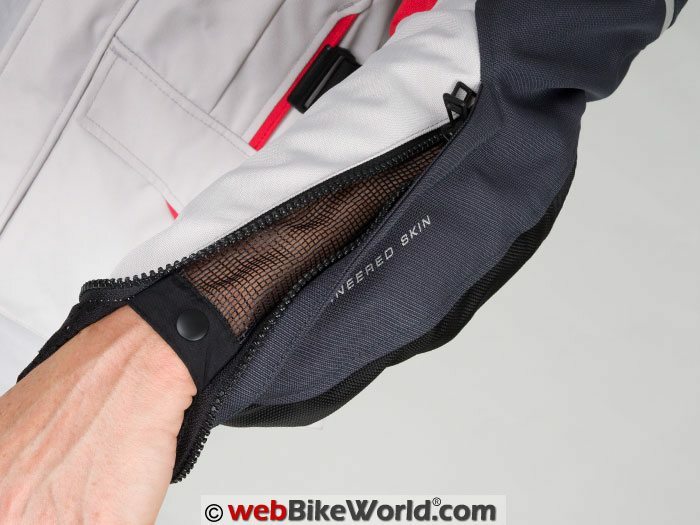 In a bit of a different twist on the standard webBikeWorld review, Carmen and I have a matched set of the Outback 2 jacket. While the women’s and men’s versions are very similar, there are differences on more than just the fit and we will call these out throughout the review. The Outback 2 jacket is the REV’IT! mid-level entry in their adventure jacket lineup, but I would really classify this jacket as more of an Adventure/Sport if such a category exists. Why? Well let’s begin with the styling. An initial glance at the Outback 2 immediately says “adventure” jacket with the multiple pockets, the high(er) collar, and long(er) waist. But looking a little closer reveals why this jacket blurs the classification lines a bit between touring and adventure-touring. In fact, the REV’IT! Sand 2 jacket (review) is shaded more towards the adventure-touring market, while the Outback 2 is a mid-range touring with a bit of adventure-touring built in. The Outback 2 has multiple pockets on the front with two chest pockets and two waist pockets with “hand warmer” pockets behind them. I used quote marks on the term “hand warmer” as these pockets are not lined and the hook-and-loop closure may feel less than ideal against the wrists with your hands in these pockets. The women’s version loses the two chest pockets but otherwise the pocket layout is the same. This makes the women’s version of the Outback 2 look more “tour” than “adventure” to me. 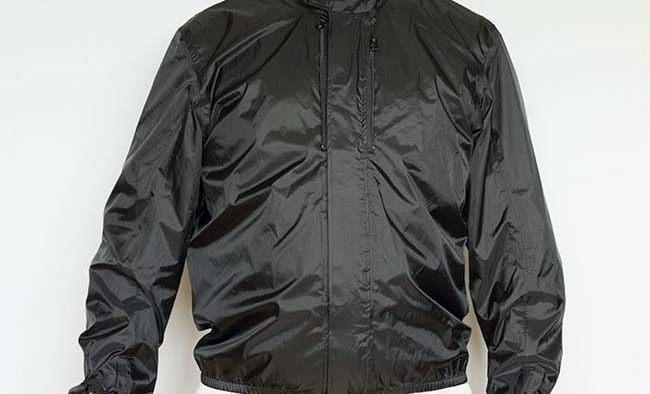 There is a large storage pocket below the waist at the back of the jacket for items such as the jacket liner(s) and there is also an inside pocket in the left chest area. All of these pockets help cement the adventure image of the Outback 2 but they are missing what I feel is a key feature in a true adventure / tour jacket and that is a waterproof closure. 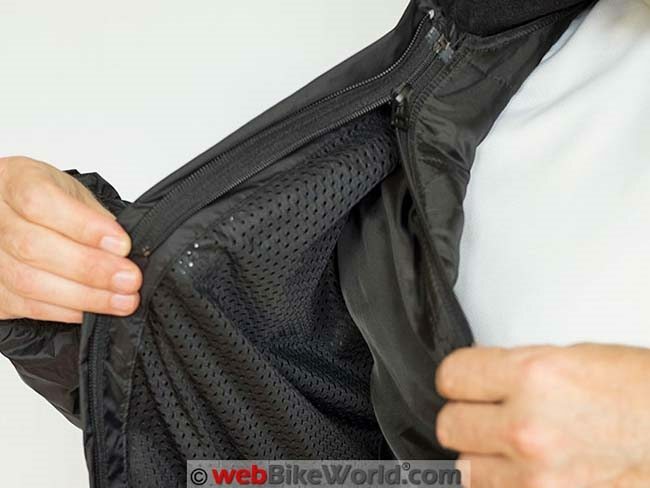 While the pockets do have a fold-over flap closure, riding in the rain at highway speeds can force water droplets to climb up under that flap and seep in. But in fairness, the shell is not the 100% waterproof type found in the higher-end REV’IT! jackets (which cost up to twice as much) and that’s why a waterproof liner is included and perhaps why the pockets are not lined with a waterproof layer. Another touring, rather than adventure aspect is the jacket length, which seems slightly shorter in the front. 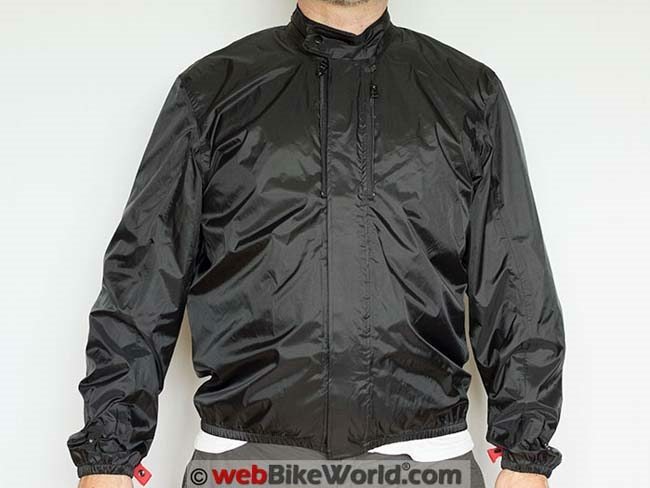 The rear of the jacket hangs noticeably lower but the front sits more like a “5/8 length” short touring or sport jacket, which adds more comfort when sitting on a touring bike. This slightly shorter front also allows the jacket to make do without a dual zipper closure present on many adventure or touring style jackets. To be clear, I’m not calling out any of these characteristics as problems but rather I find the jacket overall an interesting mix of adventure touring style with a sportier cut. The Outback 2 jacket is formed by various types of polyester with the main shell consisting of a 600D high density fabric with 1600D material used in high impact/abrasion areas on the shoulders and elbows. 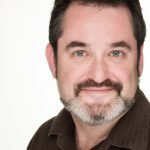 The details from REV’IT! also mention Lorica, a synthetic leather-like material, which appears to be used for the REV’IT! logo at the rear and on the shoulders. 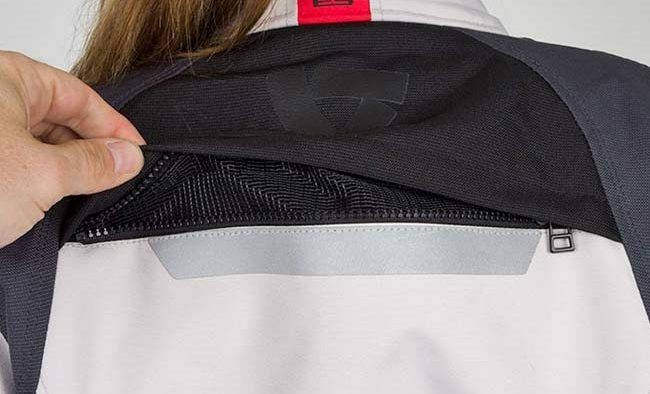 The jacket has a permanently attached polyester mesh lining with space for a back protector (not included) and a single inside pocket on the left side with a hook-and-loop closure. This pocket uses solid fabric like the outer shell on one side but the other side is the same mesh fabric as the liner, so it’s probably water-resistant, rather than waterproof. The front pockets, as mentioned earlier, use a flap closure with two large strips of hook-and-loop fastener. The inner and outer portion of the pockets make up the flap, so when they’re folded over, they work to add some water resistance to the pocket spaces. The shell material is not rated as waterproof, but I was curious. I tried to blow through the material to see if air passed through it. In no way I could put out enough pressure with my lungs to get air through. Then I tried placing a puddle of water on one of the pockets and let it stand for 5 minutes. The water pooled on top of the material and I could see smaller droplets beading up on the surface. Maybe this doesn’t mean a lot when compared to rain drops hitting the fabric at 70 mph but the Outback 2 jacket shell definitely has some water resistance, likely enough at least to handle commuting duties and perhaps even hours of touring on the highway. But a waterproof and breathable Hyrdatex liner is also included for that and I’ll described the liners shortly. Zippers are plentiful on the Outback 2 and most are of the YKK Vislon variety. 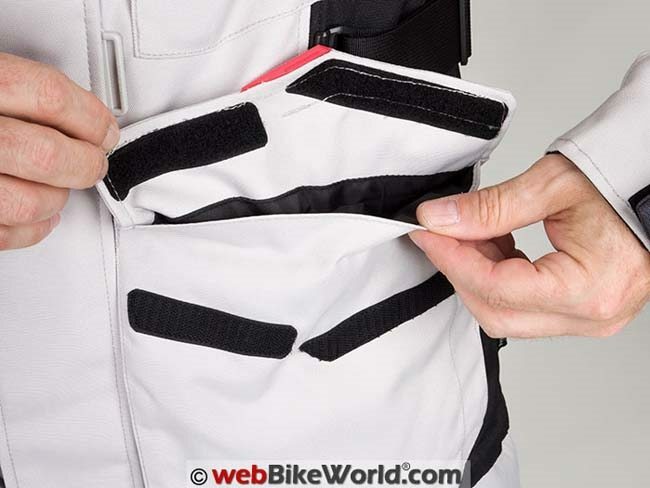 These are present at the main zipper, the sleeve cuffs, front and rear vents and even at the pants attachment point for connecting to REV’IT! brand pants. An interesting feature — to me anyway — is that the main and front vent zipper pulls have a thin rubber-like tab to make it easier to operate when wearing gloves. This is not that unusual but the fact that the rubber pulls are easily removable/replaceable items is. It’s a small thing but it is one of those nice touches that adds just a little bit of extra value. It should be noted that Carmen’s women’s version did not include the rubber tab on the main zip. While on the subject of interesting touches, both the men’s and women’s versions have a nice soft material in the collar with an equally soft microfiber welt around the top edge. The collar closure also uses the unique REV’IT! Flexisnap connector found on many of their jackets. It includes a hook on the collar to hold it open when desired — and adventure-touring feature. 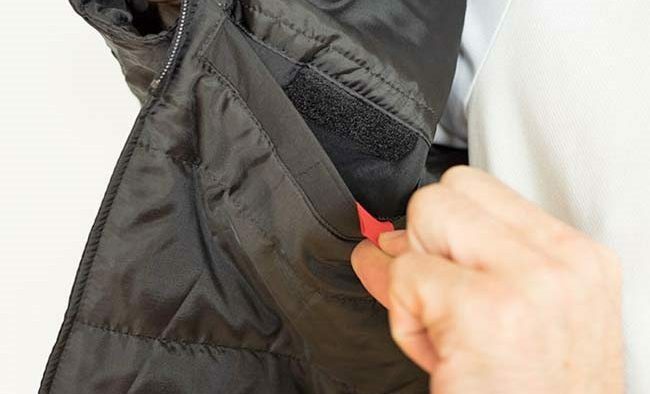 Hook-and-loop is used in several places on the jacket, with the largest section of that closure type used for the flap over the main zipper. Instead of one long strip, four long closely spaced sets of fastener are bonded to the shell. The sleeve cuffs use two separate sections of hook-and-loop; one is longer and used for adjusting the size of the sleeve opening while a smaller section is used to release the opening for removing the jacket. This allows the owner to set the opening size while still making it easily take off and put on the jacket. Another small touch that shows the thought that went into the design. (Carmen) While these jackets are both called Outback 2, REV’IT hasn’t just made a smaller version of the men’s jacket and labeled it “for women”. Instead, it looks like they took a more “from the ground up” approach here for the women’s version. Looking at the photos of Brandon and I wearing these jackets, you can see how the men’s version is much more square in its cut while the women’s version is a bit “softer” in the overall look. The absence of chest pockets on the women’s version may be seen as a minus for those looking for as much storage as possible, but the look is much cleaner and more sporty. I like how the back is longer than the front to help cover the “rear” as you lean forward in the seat. The fit is very good, thanks to the accurate sizing and all of the various adjusters. The sliding adjusters over the waist area are really useful and they adjust over a very wide range. That’s good since adding the liners can bulk this jacket up pretty quickly. I was surprised by how large the neck opening is and even when tightened, it is still a little loose. Women’s body types can vary much more than men’s, so it’s good to see that even though the women’s jacket is smaller overall, the adjusters have more travel. Another plus over the men’s version is the hip adjusters which are accessible from outside rather than up under the shell like the drawstrings found in the men’s jacket. Both the women’s and men’s version come with the same level of impact protection. The elbows and shoulder have Knox Flexiform CE protectors, which are made from flexible polyurethane and these are CE Level 2 rated. 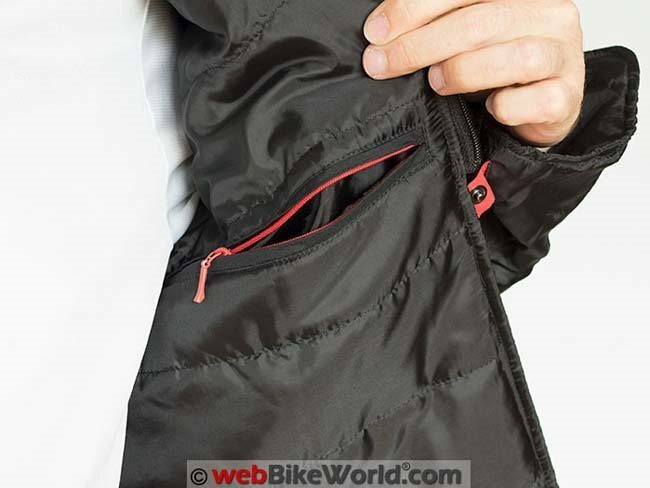 These are removable, as the pockets holding the protectors have hook-and-loop openings inside the mesh jacket liner. These particular grade of Knox protectors are very thick but still flexible at the same time. They are made from three sections, allowing them to conform easily and despite their size, they really go unnoticed when wearing the jacket. The Outback 2 jacket does not include a back protector but instead it has a space for one of theREV’IT! Seesoft Level 2 back protector inserts (report), which are available in various sizes. The reference to Seesoft is printed on the pocket opening of the jacket. Not including a back protector insert seems to be the trend in the industry. I do feel, however, that at this price point, a back protector of some sort should be included. Adding the Seesoft back protector will set you back another 50 bucks, but adds Level 2 protection. 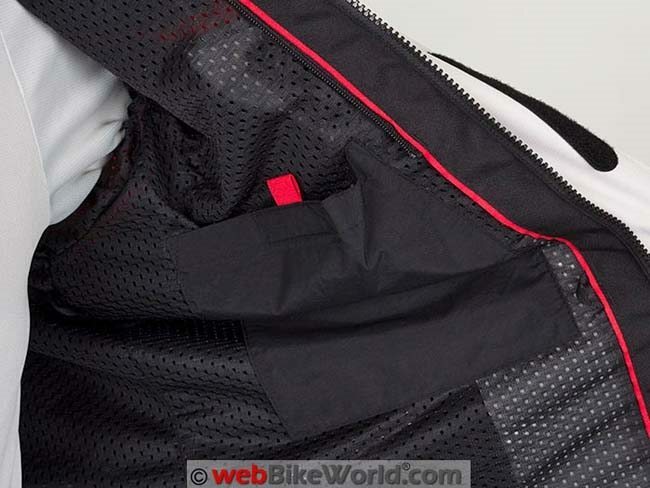 Abrasion protection is increased on the elbow areas with sections of 1600 denier fabric. The panels also have a section of accordion stretch material to help keep maintain the sleeve shape as the elbow is flexed. This is another nice touch that isn’t always found in textile jackets. REV’IT! has placed several reflectors on the Outback 2 including two strips on the upper chest area, a strip across the back, and strip on each shoulder. The REV’IT! logos on the shoulders are also set on a reflective backing that outlines the graphic. For more visibility, the jacket includes connection points for the REV’IT! 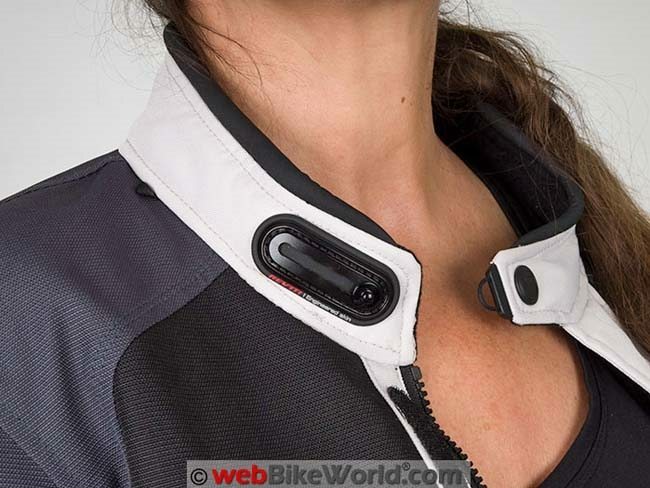 Connector HV Vest (review) which adds a Hi-Viz component that still allows access to the pockets on the jacket. This is the same for both the women’s and men’s versions. Five different vents are included in the Outback 2 shell. Starting at the rear, there is a large exhaust vent that runs across the upper back between the shoulder blades. This vent is opened with one zipper and the opening is lined with a mesh fabric. When any other vents are opened it is best to have the rear vent open. If not, the the jacket can “balloon” while air flowing in looks for an exit. The front of the men’s jacket has a vent next to the inside edge of each chest pocket, just under the edge of the actual pocket itself. Like the rear vent, when opened, these vents are lined with a mesh material. These two vents do provide some air flow but how much depends on the aerodynamics of your particular motorcycle. Even with my windscreen in the lowest position on the Ninja 1000 (review), I just don’t feel that much air flowing in. Perhaps a standard bike without a windscreen would do a bit better? Also, the left side vent is somewhat blocked by the inside pocket which sits directly behind it and I can feel the difference between the left and right side air volume. The women’s version moves the chest vents around to the sides nearly under the arms. Even though they are the same size opening as the men’s version, their position seems to help improve air flow noticeably (again this will vary, depending on the motorcycle’s aerodynamics). Fortunately, the vents in sleeves work very well on both jackets. The sleeve cuffs have a dual zipper arrangement the run all the way up to the elbow. Opening this area will reveal another section of mesh fabric like the other jacket vents. The air flowing in from these vents is excellent and it works well no matter what type of windscreen is on the bike (or not). 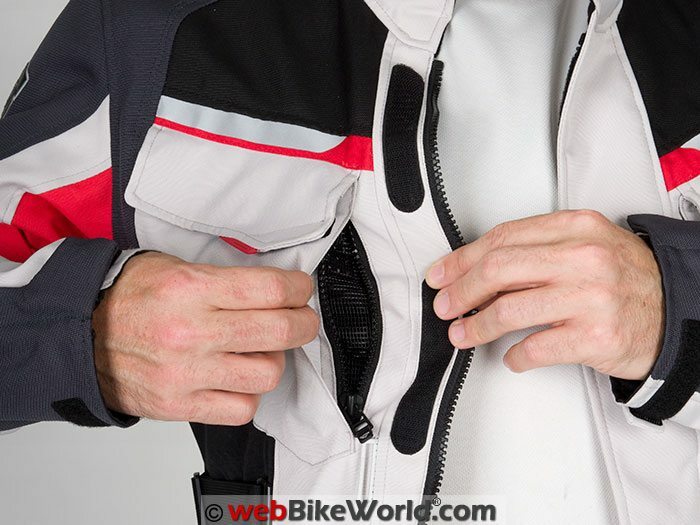 Having your arms out in the wind allows the jacket to catch plenty of air and the zipper can be used to control the amount. One minor note is that the mesh is such an open weave that sunscreen might be in order on the forearms for a long sunny day in the saddle if you’re wearing a short-sleeve shirt underneath. The waist adjustment belt can be positioned vertically. Sizing of the women’s jacket in size 40 (Euro) was just as expected and is is just right. You can tell that REV’IT! understands how to make a piece of riding gear for a woman. The sizing chart for the men’s jacket however seems off by about one size, in my opinion. I initially tried a size XL and looking at the size chart, the XL is supposed to fit a 42 to 44 inch chest, so my 43 inch chest should have been a perfect fit. When the jacket arrived, however, it was at least one size too big for me, so I ordered a size large to replace it. The size large fits me as expected and I typically wear a size large in most jackets from other brands. Both the men’s and women’s versions have the same fit adjustability features — and there are several. Starting with the arms, the wrist openings can be adjusted from a 6 inch (15 cm) to 10 inch (25.4 cm) space. There are also two-position snap adjusters at the forearm and bicep positions . REV’IT! has included an innovative feature for the neck opening that they they call Flexisnap.This snap closure uses a slider that allows the collar to be adjusted by sliding the snap through a set of five detents. 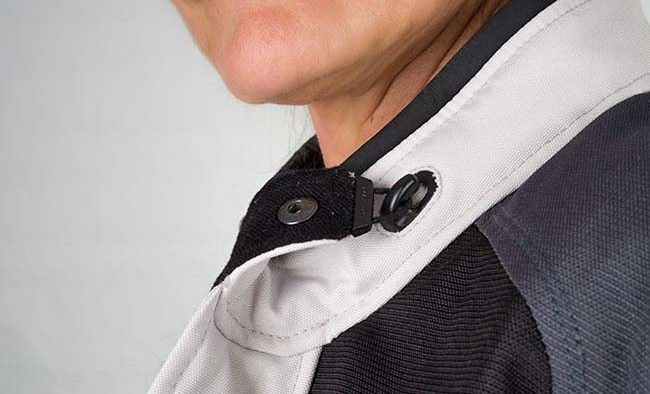 Th allows the collar to be adjustable without requiring a hook-and-loop fastener and it will likely offer a longer life versus a simple hook-and-loop only closure. On the men’s size large jacket, the Flexisnap allows the neck adjustment to vary from about a size 16 to 18 collar. As mentioned earlier, the collars on both jackets are lined with a soft fleece-like material and a microfiber welt along the edge making the collar area very comfortable. 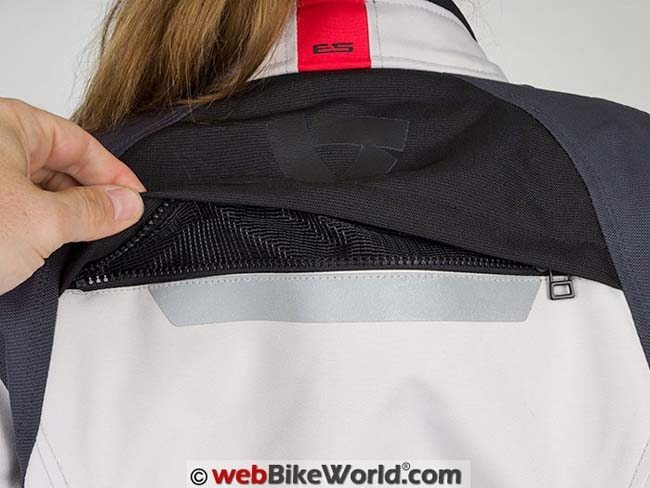 Both the men’s and women’s jackets have waist adjusters but use two different approaches. 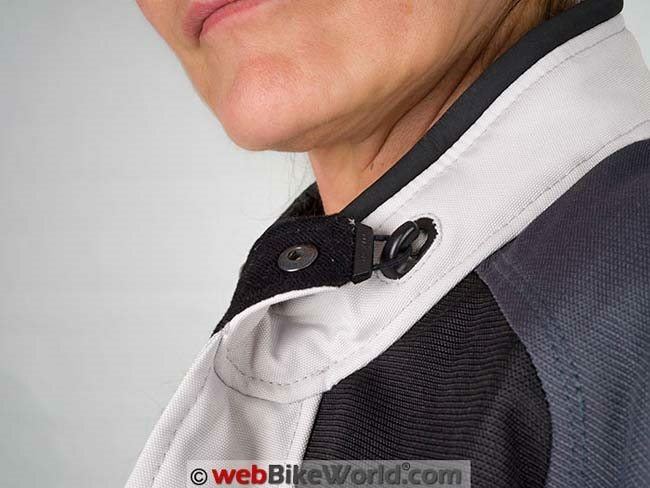 The women’s jacket uses external straps with hook-and-loop fastener on each hip to cinch the opening for a snug fit. The men’s jacket uses a shock cord and spring-loaded capture clamp on inside of the waist to adjust it. An innovative feature is present on either side of the jacket just below the ribs. Two 1.75 inch (4.5 cm) wide adjustable webbing style straps can change in length from 12 to 7 inches (30.5 to 17.75 cm) for the men’s jacket, allowing a wide range of adjustment around the stomach. 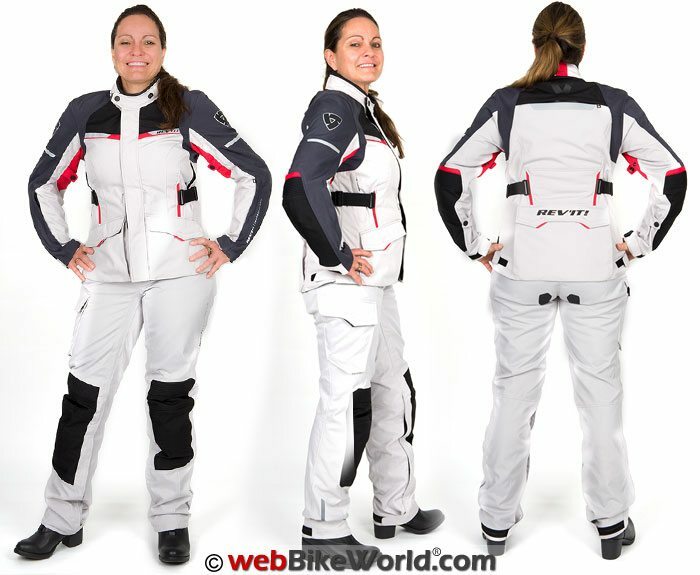 The women’s jacket has a smaller range, adjusting from 9.5 to 6.5 inches (24 to 16.5 cm). That’s not so unusual but the fact they can also slide up and down about 3.5 inches (9 cm) for the men’s jacket and 4 inches (10 cm) for the women’s version is. This is achieved by attaching the ends of the straps to a plastic “glider” that rides on a rail sewn into the jacket shell. This really allows the owner to custom fit the jacket through the mid-section and the movement takes just the right amount of effort to slide. This can be accomplished easily when wearing gloves and there is enough friction to hold the straps in place once the vertical adjustment is made. All in all, the adjustability features on the Outback 2 jackets add up to a comprehensive level of customization. This not only helps to fit varying body types but the range of adjustment also allows the use of one or both liners and be able to readjust the fit as needed. Both the men’s and women’s jackets include two liners. One is a waterproof and breathable Hydratex membrane to provide water- and wind-proofing, while the other is a polyester filled thermal liner for warmth in cold weather. They are designed so that the thermal liner will nest inside the waterproof layer but can be attached to the thermal liner in the shell alone if desired. This gives a versatile mix-and-match capability for the liners, a feature pioneered by REV’IT! starting around 10 years ago. The waterproof liner has its own main zipper and storm flap to provide waterproof coverage and since it has its own closure, the liner can be worn on its own as a light windbreaker or rain jacket. I don’t think REV’IT! designed it for this purpose but many riders who travel like to be able to repurpose gear to pack as light as possible. Of course the thermal liner could be added for extra insulation. 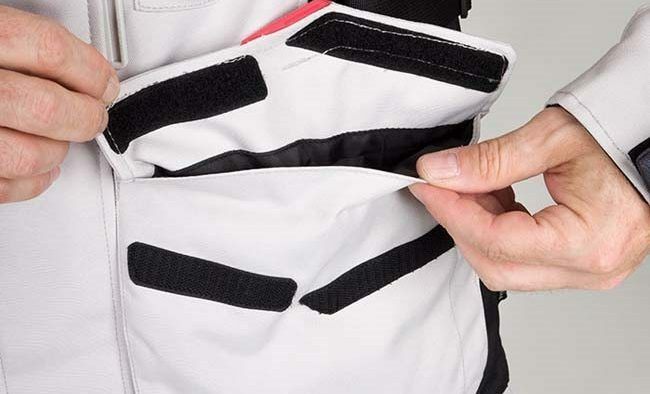 The liners use zippers and snaps to attach to the inside of the jacket shell with two snaps on each sleeve and two short zippers at the chest area. Swapping out liners is pretty easy and should make for quick changes at the side of the road if needed. The liners also include internal pockets and the waterproof liner pocket secures with hook-and-loop. The thermal liner has two pockets, with one closed via hook-and-loop and the other with a fine pitch zipper. The combination of the ventilation provided in the jacket shell and the two liners make the Outback 2 an excellent all-around three-season jacket. In cooler climes, it might even do for a four-season jacket until the temperatures reach around 30 C (90 F). At that point the venting may not be enough for comfort, but what non-mesh jacket would? At those temperatures, reach for the full mesh. As an aside, REV’IT! does make a cooling vest that attaches to the same zippers as the included liners. It’s called the Challenger vest and it can help make the Outback 2 jacket more comfortable if evaporative cooling works in your region. Here in Tennessee, our heat often comes with high humidity, which lessens the efficiency of this type of cooling. The REV’IT! Outback 2 jacket is very good choice for the rider looking to have one jacket that does it all. The styling is decidedly adventure-like but the weight and cut are more reminiscent of a sport touring jacket. I am disappointed by the lack of any included back protection but this is not just an issue with REV’IT! but the industry as a whole moving (has moved) this way. The included safety features are very good and appropriate for the intended mission of this jacket. The overall quality is very much what I would expect from the REV’IT! brand, with the materials and stitching very well sorted and neat. The sizing issues for the men’s version, at least based on their sizing chart, can be an important issue to be aware of when ordering this jacket. I can highly recommend the Outback 2 for the motorcycle riding commuter. Storage options and easily changed liners make it useful for shuttling from home to work while being versatile enough for day tripping and weekend canyon carving. And yes, probably a bit of adventure riding would fit in there as well.